Based on visual observations and seismic data, CVGHM raised the Alert Level for Tambora to 2 (on a scale of 1-4) on 5 April. Beginning in April 2011, Tambora volcano, Indonesia (figure 1), experienced increased seismic activity and minor steam venting. As a result, the Center for Volcanology and Geological Hazard Mitigation (CVGHM) raised the Alert Level for Tambora. This report will summarize the increased activity from April 2011 through 8 September 2011, as reported by CVGHM. Figure 1. Regional (top) and local (bottom) geographic setting of Tambora volcano, Indonesia. Courtesy of Wilford (2006) and the New York Times. Seismicity at Tambora increased steadily from April 2011 to at least 8 September. CVGHM reported six seismic signals that were monitored: volcanic earthquakes (VA), shallow volcanic earthquakes (VB), distant tectonic earthquakes (TJ), local tectonic earthquakes (TL), low-frequency earthquakes (LF), and volcanic tremor. Seismic activity from April through August is summarized in figure 2. In addition to increased seismicity, ground-based observers described dense white plumes rising 50-75 m above the caldera rim in April and June. Figure 2. Reported seismic activity at Tambora cumulative by month from April through August 2011. Onset of continuous volcanic tremor on 29 August is not represented. Data from CVGHM. Volcanic tremor started 29 August and continued every day since, with the exception of 3 September (table 1). The tremor was accompanied by diffuse plumes rising 10-20 m above the caldera rim on 29 August and 5 September. Based on seismic activity and visual observations, CVGHM raised the Alert Level to 2 (on a scale from 1 to 4) on 30 August, and forbade access to the peak of Tambora. Table 1. Summary of seismicity at Tambora since the onset of volcanic tremor on 29 August 2011. On both 29 August and 5 September seismicity was accompanied by plumes rising 10-20 m above the caldera rim. Data from CVGHM. Along with the continuation of the tremor after 29 August, CVGHM reported an increase in other types of seismic activity from 30 August to 7 September. On 5 September an earthquake was felt by residents (exact location undisclosed). Instruments recorded 40 volcanic earthquakes on 7 September (table 1); 32 of those were recorded within 6 hours. On 8 September, CVGHM raised the Alert Level to 3, invoked a 3 km exclusion zone, and prohibited access to Disaster Prone Areas III, summarized in table 2. The Disaster Prone Areas were largely based on the devastating 1815 eruption of Tambora. As of 21 September, the Alert Level remained at 3. Table 2. Summary of Disaster Prone Areas at Tambora defined on the basis of radial distance from the peak of Tambora. Courtesy of CVGHM. Disaster Prone Area I 8 km Lahars, ash fall, and incandescent bombs. Disaster Prone Area II 5 km Pyroclastic flows, lava flows, toxic gases, incandescent bombs, ash fall, lahars/mudflows, and high acidity in water. Disaster Prone Area III 3 km Pyroclastic flows, lava flows, toxic gases, incandescent bombs, and heavy ash fall. References. 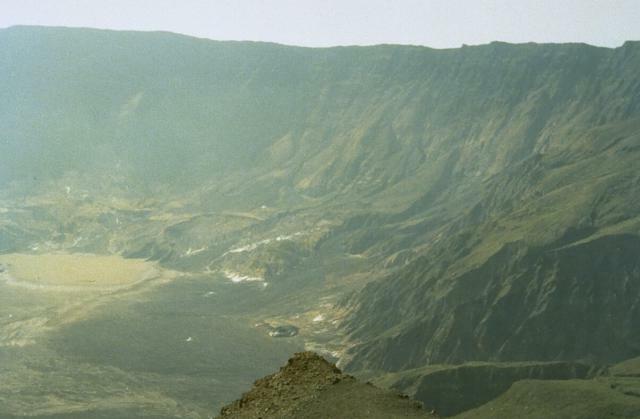 Wilford, J.N., 2006, Under an 1815 Volcano Eruption, Remains of a 'Lost Kingdom', the New York Times, URL: http://www.nytimes.com/2006/02/28/science/28volc.html; Posted 28 February 2006; accessed 26 September 2011. Information Contacts: Center for Volcanology and Geological Hazard Mitigation (CVGHM), Jl. Diponegoro 57, Bandung, West Java, Indonesia, 40 122 (URL: http://www.vsi.esdm.go.id/). CVGHM reported that during January-8 April plumes did not rise from Tambora, no changes were observed around the caldera, and seismicity decreased. On 9 April the Alert Level was lowered to 1 (on a scale of 1-4). CVGHM reported that during 22 September-9 October plumes did not rise from Tambora; seismicity fluctuated, but declined overall. Based on visual observations, deformation data, and seismicity, the Alert Level was lowered to 2 (on a scale of 1-4) on 9 October. Based on visual observation and seismic data, CVGHM reported an increase in activity at Tambora during the previous five months. Ground-based observers at an observation post in Tambora village noted dense white plumes rising 50-75 m above the caldera rim during April and June, but no plumes during May or July. In August dense white plumes rose 20 m above the caldera rim. Seismicity started to increase in April and continued to increase through August. On 30 August the Alert Level was raised to 2 (on a scale of 1-4). The massive Tambora stratovolcano forms the entire 60-km-wide Sanggar Peninsula on northern Sumbawa Island. The largely trachybasaltic-to-trachyandesitic volcano grew to about 4,000 m elevation before forming a caldera more than 43,000 years ago. Late-Pleistocene lava flows largely filled the early caldera, after which activity changed to dominantly explosive eruptions during the early Holocene. Tambora was the source of history's largest explosive eruption, in April 1815. Pyroclastic flows reached the sea on all sides of the peninsula, and heavy tephra fall devastated croplands, causing an estimated 60,000 fatalities. The eruption of an estimated more than 150 km3 of tephra formed a 6-km-wide, 1250-m-deep caldera and produced global climatic effects. Minor lava domes and flows have been extruded on the caldera floor at Tambora during the 19th and 20th centuries. Barberi F, Bigioggero B, Boriani A, Cattaneo M, Cavallin A, Cioni R, Eva C, Gelmini R, Giorgetti F, Iaccarino S, Innocenti F, Marinelli G, Slejko D, Sudradjat A, 1987. The island of Sumbawa: a major structural discontinuity in the Indonesia arc. Bol Soc Geol Italy, 106: 547-620. Foden J, 1986. The petrology of Tambora Volcano, Indonesia: A model for the 1815 eruption. J. Volcanol. Geotherm. Res., 27: 1-41. Self S, Rampino M R, Newton M S, Wolff J A, 1984. Volcanological Study of the Great Tambora eruption of 1815. Geology, 12: 659-663. Sigurdsson H, Carey S, 1989. 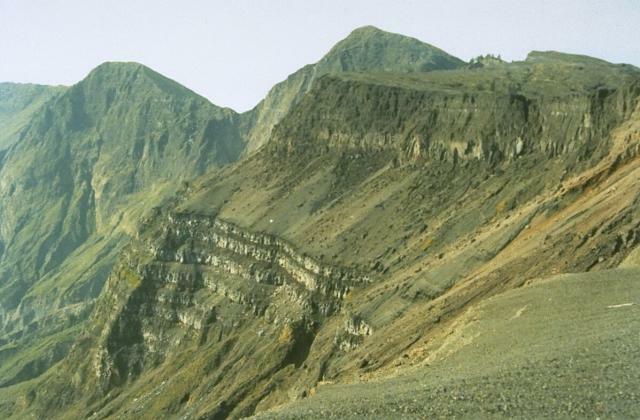 Plinian and co-ignimbrite tephra fall from the 1815 eruption of Tambora volcano. Bull Volcanol, 51: 243-270. Sigurdsson H, Carey S, 1992. Eruptive history of Tambora volcano, Indonesia. In: Degens E T, Wong H K, Zen M T (eds) The Sea off Mount Tambora, Mitteilschen Geol-Palaont Inst Univ Hamburg, 70: 187-206. Stothers R B, 1984. The great Tambora eruption in 1815 and its aftermath. Science, 224: 1191-1198. There is no Deformation History data available for Tambora. There is no Emissions History data available for Tambora. 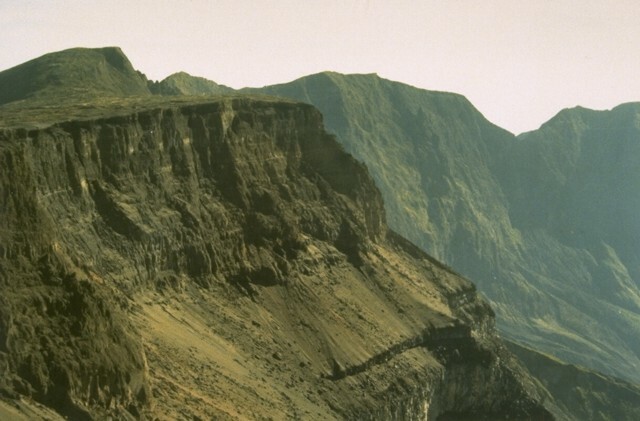 Tambora's serrated NE caldera rim towers 1250 m above the caldera floor. The 6-km-wide caldera was formed in 1815, during one of the world's most powerful eruptions of the past 10,000 years. Since 1815 only a few minor eruptions have occurred on the caldera floor. Photo by Rizal Dasoeki, 1986 (Volcanological Survey of Indonesia). 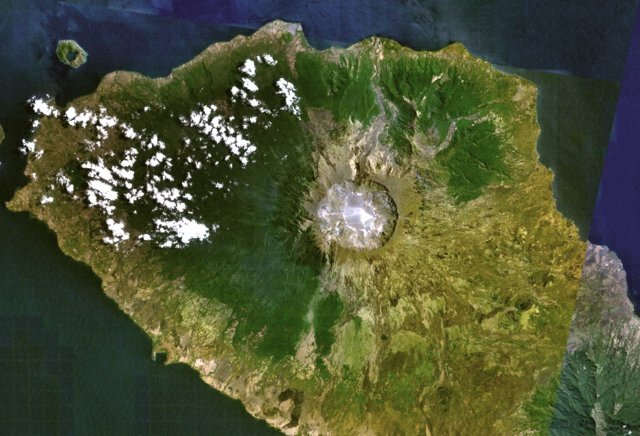 Tambora's caldera, seen here from the western rim, was formed during the eruption of 1815 following the ejection of about 150 cu km of airfall tephra and pyroclastic flows. This was history's largest explosive eruption, and occurred following low-level eruptive activity that began in 1812. Only a few minor eruptions have taken place since formation of the 6-km-wide and 1250-m-deep caldera. The caldera rim is rarely visited and the last eruption, producing a blocky lava flow on the caldera floor, is known only to have occurred sometime between 1947 and 1968. The bottom portion of this cliff section in the center of the western wall of the Tambora caldera shows a thick sequence of bedded lava flows that filled an earlier Tambora caldera formed 43,000 years ago. The even-textured sloping surface above it consists of pyroclastic material erupted between about 5900 and 1210 years ago. This is overlain (upper right) by another cliff-forming unit, about 200 m thick, produced during the 1815 eruption. These upper cliffs expose airfall-pumice deposits at the base, above which is a thick sequence of pyroclastic-flow deposits. Tambora volcano on Indonesia's Sumbawa Island was the site of the world's largest historical eruption in April 1815. This NASA Landsat mosaic shows the 6-km-wide caldera truncating the 2850-m-high summit of the massive volcano. Pyroclastic flows during the 1815 eruption reached the sea on all sides of the 60-km-wide volcanic peninsula, and the ejection of large amounts of tephra caused world-wide temperature declines in 1815 and 1816. IRIS seismic stations/networks Incorporated Research Institutions for Seismology (IRIS) Data Services map showing the location of seismic stations from all available networks (permanent or temporary) within a radius of 0.18° (about 20 km at mid-latitudes) from the given location of Tambora. Users can customize a variety of filters and options in the left panel. Note that if there are no stations are known the map will default to show the entire world with a "No data matched request" error notice. Large Eruptions of Tambora Information about large Quaternary eruptions (VEI >= 4) is cataloged in the Large Magnitude Explosive Volcanic Eruptions (LaMEVE) database of the Volcano Global Risk Identification and Analysis Project (VOGRIPA).